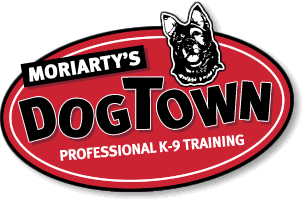 Moriarty's Dog Town, Professional K-9 Training, dog training - How do I stop my dog from jumping on people? > Dog Training > FAQ - Frequently Asked Questions > How do I stop my dog from jumping on people? Dog jumping up on people always starts out as cute when your dog is a puppy, but as they grow this habit not only becomes annoying it also become dangerous. If a child or elderly person come near your dog and they jump up to say hi, they could knock that person back and cause injury. One way to start to teach your do to not jump up is when they jump on you, turn away from them and say off in a firm voice, then redirect their attention to a sit command, once they sit reward the good behavior. To learn more tips on how to stop your dog from jumping call me at 413-525-9998.